Welcome to a new year of Meezer Musings! Here we are again and although it's probably a little late in the month to wish you a happy New Year, it's not too late to wish you a very happy 2018! I came across the Douglas Adams quote above soon after watching a TV documentary featuring the Queen (the British monarch, just in case you were wondering!) and the crowns she wears for different state occasions. In particular, it showed the crown worn at the coronation, with the Queen herself providing comments and memories along with the jewels on show. It was a wonderful documentary but the Queen does have rather a scary, questioning look sometimes - and this is exactly the way a Siamese cat looks at you when it wants something from you and thinks you're being particularly stupid. I have no idea how Douglas Adams, who wrote The Hitchhikers Guide to the Galaxy among many other weird and wonderful books, knew this. Or, for that matter, how he knew anything about Siamese cats, or what the Queen looks like when you walk in on her when she's cleaning her teeth! It's not entirely clear where the quote comes from either, although it seems likely that it's from The Salmon of Doubt (Amazon link), which is a collection of writings both by and about Douglas Adams, and published after his untimely death. One of the stories (sadly unfinished) includes, in true Douglas Adams style, the search for the missing rear half of a Siamese cat. So he must have known something about them! 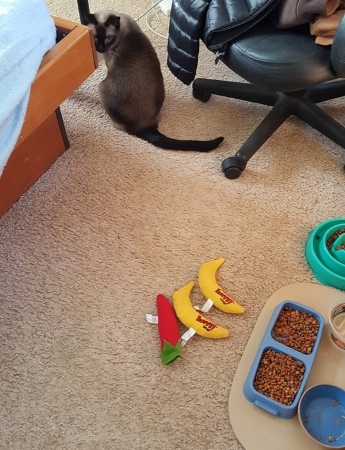 All of the above is just by way of an introduction to our topic for this month - the weird, strange, and typically Siamese behavior that our Meezers are known for. 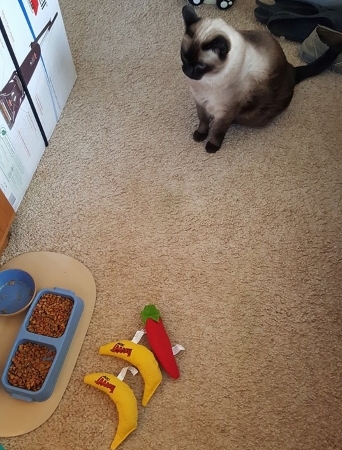 This was chosen for two reasons - the first was because of a question I noticed in a Siamese cat group I belong to, from a long-time, very experienced, multiple-cat owner who'd recently rescued a Siamese cat, having, up until then, never had one. Were Siamese cats, they asked, always so very active? And did they always shout so loudly? The answer to both questions, of course, as most of us will know , is very probably yes! 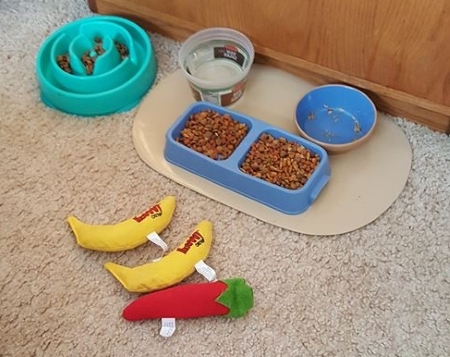 The second reason I chose behavior was because of a question from one of our Facebook visitors, Rochelle, who asked "does anyone else's cats line up their toys in front of their food bowls?" You can see the photo Rochelle took of this at the top of the newsletter, along with the two below. Some of the answers to Rochelle's question are shown below, proving that if you have a cat that does any of these things, you're not alone! You can see the whole thread of Rochelle's question (and subsequent answers) over on our Facebook page, where you can share your own thoughts and photos too, if you like! This was only a couple of weeks ago, but it certainly isn't the first time this kind of question has been asked - in fact we have on record a whole army of Siamese cats exhibiting equally strange behavior traits! In need of a trim? As you may know if you've been following us for a while, my boy Bandit was diagnosed with chronic kidney disease (CKD) around fourteen months ago. He's doing quite well but has lost a lot of weight, which is very typical of cats with CKD. His ongoing care includes monthly vet visits for B12 and laurabolin (an anabolic steroid) injections, and a short check-up. 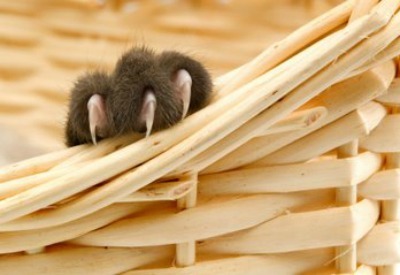 At our visit last week the vet said she thought Bandit's claws were getting too long. This was something I'd noticed myself. Cats' claws become thicker with age and as older cats slow down, they don't wear down their claws as easily as they do when they're younger and running around a lot and using scratching posts. Bandit used to spend a lot of time outdoors and never needed to have his claws clipped; they wore down naturally, so I'd never bought claw clippers. The vet used hers to trim Bandit's dew claws, but after that, and his injections as well, he wasn't too happy about having anything else done and we didn't want to stress him any more than necessary, so I've bought a little pair of claw clippers for myself and I've gradually been trimming the claws on each paw in turn. 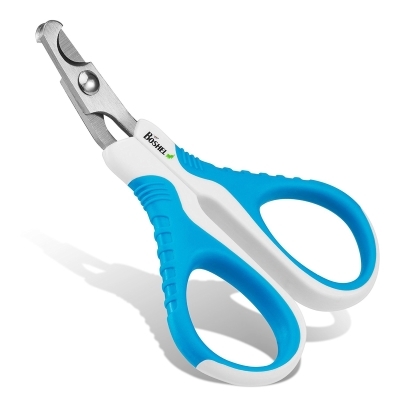 Ideally you need a pair of scissor-like clippers with an angled head and non-slip grips to avoid accidents, which should be small enough to be non-threatening, like these ones from Boshel, available on Amazon. Many owners have their cats' claws clipped by a vet or groomer, but if you'd like to try this yourself, head over to our page Clipping Cat Claws, which contains some useful hints and tips, including one that came from one of our site visitors. 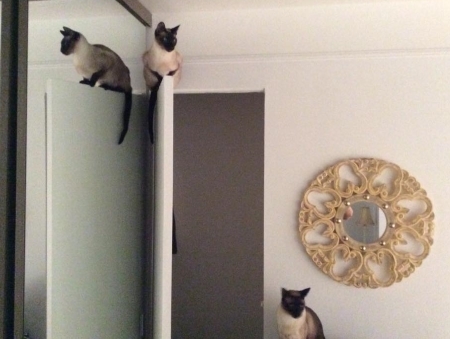 Siamese cats are active cats with very long, muscular legs and think nothing of making their way to the highest point of the room they can find - very often, like Superman, in a single bound. I was delighted to see this photo on our Facebook page from Jacqueline Doucet of her cats Jay The Athlete (on the door) and Jake, who looks as if he might be saying "you wouldn't catch me up there"! Jay and Jake have a further sibling, Jack, and you can see a lovely photo of the three of them over on our Facebook page, relaxing after a busy morning. Thanks Jacqueline! Not long ago, in preparation for some work I'm planning to do on this website, I was looking into the kind of searches people make on Google and other search engines for 'Siamese'. It amused me to find, among all the searches for Siamese cat-related things, many other types of 'Siamese', so I thought I'd share them with you. There are, of course, Siamese twins - and then all manner of scaly Siamese from various types of Siamese aquarium fish (carp, fighting, tiger, algae eaters, Flying Foxes); to a Siamese crocodile (Crocodylus siamensis); to Siamese snakes (two-headed ones! ); and a Siamese spitting cobra (Naja siamensis). And then we have Siamese cable (for power and video for CCTV and surveillance); a music festival (Siamese True Metal); The Association of Siamese Architects, any number of Thai restaurants - Siamese Kitchen, the Siamese Palace, Siamese Hut, Siamese Orchid (which is also a special type of vase) and finally a number of song titles (Siamese Dreams, Siamese Almeida, Siamese Cities). We'll be back at the end of February. Meanwhile, have a very happy month, and if you do happen to walk in on the Queen cleaning her teeth - doesn't she just remind you of your Meezer?